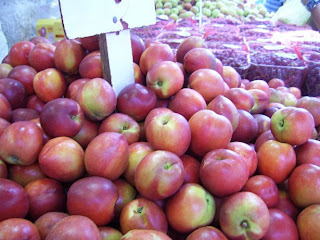 A letter from Israel: One of my Favorite Hang-outs in Israel, the veggie market! One of my Favorite Hang-outs in Israel, the veggie market! Every decent city in Israel got a fruit and vegetable market. Our nearest one is in Hadera. You have to be a bit brave to enter a market. It used to be a favourite hangout for suicide bombers here in Israel. But the markets are usually well guarded and everyone knows that you keep your eyes peeled for anybody wearing an over- large parka, or somebody that seems out of place. That is not so easy to do. Markets are very popular and all the different population groups in Israel can be found at the markets. Here in Hadera most of the stalls belong to Kafkhazi's. Apparently it is one of the small states inside Russia that have not gained independence yet. The strawberries were very cheap. Four shekels for a kilo, but then they scoop it up for you. If you want to pick and choose, then it is six shekels a kilo. I have never heard that you pay more for picking out. In the end I took two kilo's for eight shekels. We were soon seduced by all the wonderful fruit and vegetables. I just wanted to buy everything. The only thing that kept me from overspending was that our shopping bags were starting to get too heavy to carry. I have already bought apples and potatoes (only 3 shekels a kilo) cucumbers and two kilos of strawberries. There were only space for a few spring onions. On our way out I noticed a lady going through a basket of fresh garlic. They smell much more potent than the dry variety that we are used to. When I asked her what she does with it, she answered that she cooks them in a stew with meat. She said it is a bit smelly but a lot of people are more smelly than her cooking! I made potatoes in the oven for my daughters that evening and if any of the two kilo of strawberries get left over I will make my simple Double Impact Strawberry Pudding. Wash about 4 big potatoes, leave the skin on. Cut them in slices with one garlic clove that is chopped up. Add some salt and two spoons full of olive oil. Bake in a baking tray in the oven for about 40 minutes at 200 degree Celsius. Wash very well about 500 grams of strawberries. Cut in quarters and sprinkle with a desert spoon of sugar. Now stick it in the fridge for about an hour or more. The sugar makes a nice watery pink juice. Scoop over a pot of strawberry yoghurt and mix well. Serve in little dishes as a light summer pudding.